Boldenone is quite popular not only in veterinary medicine from all that is used for cows, horses and dogs, but also very much preferred by most bodybuilders, due to its unique performance. It possesses such characteristics that you will not find in any substance, and its use is so diverse that it cannot but impress. Boldenone is a true anabolic in combination with weak androgenic and estrogenic effects. Something like soft testosterone. In structure, it is no different from testosterone, the main feature is the presence of a double bond in the first position and also in the fourth. This fact, however, gives the drug a good demand. The peculiarity of boldenone formula, or rather the androgenic component in the chain, is that it does not belong to the 5-alpha abbreviated form, as is the case with most steroids. 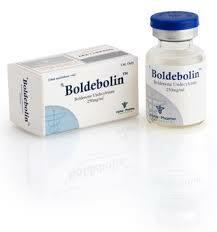 In turn, boldenone has its own formula 5AP (dihydroboldenone, approximately 7 times more anabolic than testosterone). Hence the conclusion that most of the anabolic effect of boldenone is based on the fact that the hormone itself binds to the androgen receptor. Perhaps this is the reason for his successful advancement in veterinary medicine, despite the differences in the metabolism of animal species, he always showed extraordinary results. Like most steroids, boldenone helps build muscle mass by increasing the nitrogen balance in a positive direction, which leads to a productive, protein synthesis, and a significant increase in appetite! Among the well-known drugs that have long been known, most people are looking for something that can surpass the existing results, and this is the reason why boldenone is successful. The proof is not even its anabolic activity, but the end result after the course. Boldenone, although it has estrogenic activity, is very weak, which is more positive than negative. Aromatization using boldenone is so insignificant that it can not lead to real problems, usually in the normal dosage (300-400 mg / week) such phenomena as gynecomastia and excessive fat deposition are excluded. However, a slight aromatization is desirable, since estrogens directly affect anabolic activity. Possible for better utilization of glucose (replenishing glycogen stores) and stimulating the release of growth hormone. Most estrogens have the ability to update androgen receptors, allowing the hormones acting on them to achieve the greatest anabolic effect. That is why such strong androgenic steroids as anadrol and testosterone, but also significantly contributing to aromatization, can produce a greater mass growth. From this point of view, boldenone, the most suitable steroid, due to its moderate estrogenic activity, which only benefits, but does not lead to aromatization. And without a doubt, this excellent balance, in practice, plays a role in stimulating appetite. For athletes not weightlifting or bodybuilding, I also note that boldenone is one of the most preferred steroids, as it also stimulates the kidneys to release eretropoietin, a hormone known as EPO and stimulating the production of red blood cells (red blood cells). The role of red blood cells – is the transfer of oxygen to all tissues and cells of the body, oxygen, in turn, is of great importance to achieve the best results for a long time. In bodybuilding, these characteristics can be very useful for maintaining venousness, for example. For this, a combination of boldenone with non-aromatics such as Winstrol or Primobolan will perfectly help to maintain dry weight and venousness. The only thing you need to do is try to restrain an increased appetite. Therefore, it may be a good idea to combine large doses of boldenone with such steroids (working on the mass) as anadrol and testosterone for amazing results. The side effects of boldenone are very minor. At a dosage of 300-400 mg per week, no aromatization reaction occurs even in people susceptible to estrogen. In the case of the androgenic effect of boldenone with prolonged use or large dosages, minor virilization events are possible, such as acne and hair growth. For men, no real contraindications, and women should be used depending on their androgen sensitivity, what you should know.